Motto: "Our bite is the source of our bark." "Busy as a beaver," goes the old saying, and that is especially true come autumn. 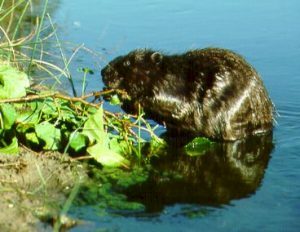 Beaver modify their environment for their own purposes more than any other animal except man. Under their direction, a small stream flowing through a wooded valley will become a pond edged with shrubby second-growth forest. Eventually, if the beavers live there long enough, the pond will fill in with detritus and soil, becoming a fertile meadow. 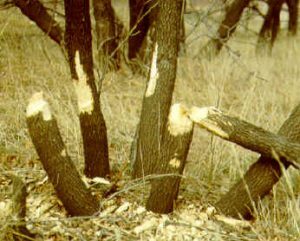 All this activity is a direct consequence of the ecological niche that beavers occupy. Beaver are strict herbivores who do not hibernate. They eat the inner bark of trees during winter. During the growing season, they eat a variety of vegetation including various aquatic plants and the leaves and small twigs of many different kinds of trees. While they may ingest a small amount of wood as they eat, they cannot digest it readily and it is not what they are after. Beaver use deep water as a defense against predators. They construct dams on small streams to create the deep water they need. Their dams are located and constructed with great engineering skill. Dams are typically made with the leftovers from their dinner (gnawed branches) and mud dredged up from the bottom of the pond or stream. Rocks, mussel shells and other objects may also become part of the dam. Because they are so thoroughly adapted to an aquatic lifestyle, they do not have the ability to climb trees. In order to get the food that is out of their reach, they chew around the base of the tree until it falls. They do not know which way the tree will drop and are sometimes injured or killed by larger trees. Beaver are the biggest rodents in North America. Adults typically weigh between 14 and 27 kg (31 - 60 lb.) One captured in Kansas weighed 44 kg (97 lb.)!! In all the world, the only larger rodent is the South American Capybara. The front teeth (incisors) of a beaver, or any other rodent, grow throughout the life of the animal. The front surface of the incisors is made of a very hard enamel that is dull orange in color. Since the back part of the tooth is not as hard, it wears off first, resulting in a chisel-like shape which, for a beaver, is perfect for the tasks of felling trees and stripping their bark. A beaver can drop a 5 cm. (2") tree in just a few minutes. A beaver's front feet have 5 fingers and are very skilled at manipulating objects. They can take a twig no bigger than a pencil and twirl it around like corn on the cob as they nibble off the bark. 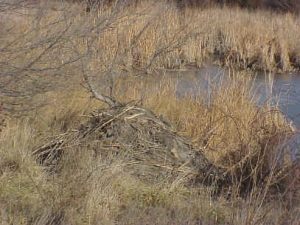 Beaver who live in Kansas rivers typically do not make a lodge or a dam. They make their home in a bank burrow with an underwater entrance. Sometimes these become quite obvious when the river is low. Dams are unnecessary since the rivers remain deep and unfrozen. Beaver who inhabit smaller streams or ponds will make lodges so they can be active all winter and as a defense against predators. The lodge will be made of the same stuff they make their dam from - primarily mud and branches. The presence of these large rodents becomes very noticeable late in the season as they prepare for winter. Since the surface of the body of water, they live in may freeze solid, making it difficult to get to trees, beaver will chew down extra ones for an underwater food cache located near the den or lodge. They also must ensure their dams and lodges are ready for winter, which requires them to drop even more trees. All this furry forestry makes beavers in the neighborhood quite obvious in the fall. Beaver were originally found throughout the northern hemisphere. The popularity of felt hats and clothing made from the fur and hides of beaver, along with the lack of any regulation of trapping, led to their extirpation from a large portion of their range. They became extinct in England in the 13th century. They became economically extinct - that is, so scarce as to make them not worth pursuing - in Europe just as the European colonists found abundant populations of beaver in North America. The trappers began ruthlessly exploiting this new source, and as the beaver populations close to the coast were depleted, the trappers began moving inland. In fact, it was the pursuit of new populations of beaver for the fur trade that was the main motive for the exploration of the interior of the continent. Beaver might have been driven to extinction in North America if fashions had not changed with the increasing popularity of silk (instead of felt) hats starting around 1840. Their cheeks close behind their incisors so they can grasp and tow branches underwater. Their ear canals and nasal openings can be closed to keep water out. They have an inner transparent eyelid to allow underwater vision. Their hind feet are large and have webbed toes for swimming. They can hold their breath for up to 15 minutes. The underfur is very dense and traps a layer of air next to the skin for insulation. The fur is further waterproofed by rubbing an oil produced by the castor gland into it. Beaver spend a lot of time grooming their fur when out of the water so as to maintain its protective ability. They have a special "comb claw" on the second toe of each hind foot that is used as a curry comb during grooming. It serves as a place to store fat. It works as a rudder and also helps the hind feet push the animal forward when swimming. It is a portable chair. They will either lean back against it when standing on their back legs or they will fold it around beneath them when sitting and grooming themselves. When they sense danger, they will slap the surface of the water with it to warn other beavers. It is not a tool for either transporting or applying mud to the dam or lodge. They do that with their front legs and hands. It is not used as a club to fight off enemies. They defend themselves mainly by biting and scratching. They live in family groups consisting of the parents, young of the year and two-year-old offspring. Litter size averages 3, so a family of 8 beavers would not be uncommon. The family will mark its territory with scent mounds made of mud, feces, and castoreum (an aromatic secretion produced by the castor gland). These serve to inform their neighbors where the "property lines" are. Social grooming, play, and vocal communication help to maintain the family bonds. With their human-like family life and highly developed engineering skills, beavers have always fascinated people. 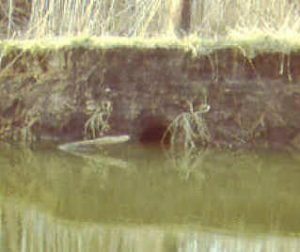 If you look carefully along the watercourses in your area, you may find evidence of these industrious rodents, and if you are very lucky, you may spy one swimming by on one of its many daily errands.